General info – Violet Evergarden. Violet Evergarden is a 14 episode winter anime with the duration of an episode being 23 minutes. It’s rated 8.41/10 on MAL and has mixed opinions. 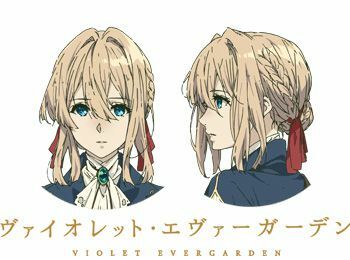 Violet Evergarden’s genres are drama and fantasy. The studio is named Kyoto Animation, which has also made animes such as Clannad and Chuunibyou demo Koi ga Shitai. Violet is voiced by Ishiwaka, Yui, the voice actor of Mikasa Ackerman in “Attack on Titan” and a supporting voice actor in “Aikatsu”. The age rating for this anime is PG 13. It started airing on Jan 11, 2018. Indeed, this is an interesting one. It really lays in personal preference. Everyone’s opinions differ but damn, Violet Evergarden has split opinions. The story is simpler than I thought. I was disappointed, I’ll admit as the anime was hyped so much. I’d expect more. 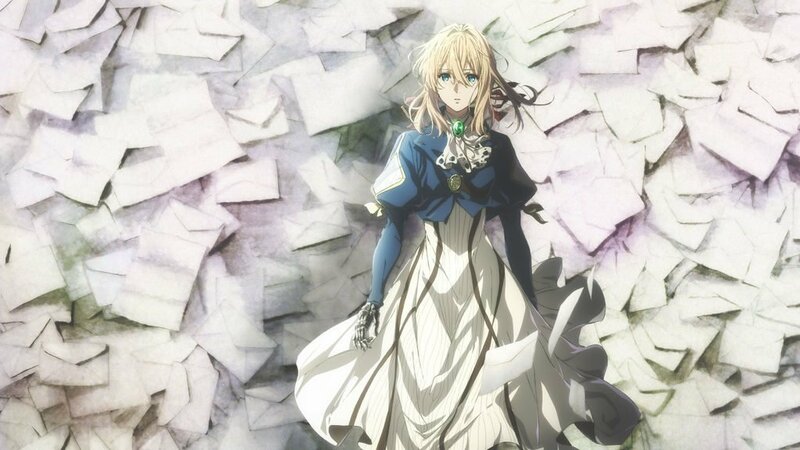 However, some argue despite the simple story, Violet Evergarden executed perfectly. And, some say it was tackled awfully. (This is what I meant by “split opinions”. Literally opposites!) For me, despite being disappointed, I wouldn’t say it was tackled awfully. It has room for improvement definitely but the characters make up for the plot, I think. I didn’t expect this, to say the least; but the anime focuses on Violet’s character, background and story. Rather than the plot. I think most people (well, me, at least) thought this would be thought-provoking, something with a deep meaning. 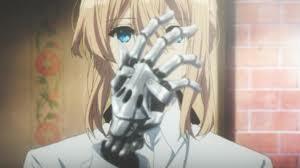 But this anime is really just a war-torn girl trying to find herself; trying to find the meaning of love. Although some argue this is just sappy, I really like the concept. You have to remember that her only purpose was to help the army – not to have a personality, have friends or do normal things like an ordinary girl. In conclusion, indeed, I was disappointed by the simple plot but I think it was done well or okay to a certain extent so I didn’t mind. I actually like the “sappy” concept of the girl trying to find herself. I quickly got over the fact it wouldn’t be that thought-provoking, deep anime I thought it would be. “She’s bland! She’s boring! She has no character! She’s weird; she doesn’t have feelings!” One word – DEVELOPMENT. Of course, she isn’t going to develop in the first episode. The characters in Violet Evergarden have faults, yes, but some of the accusations haven’t been well-thought-out. First of all, yes, she acts robotic and acts like she has no feelings whatsoever. This is because she’s spent her whole life serving the only purpose of helping the army. She has had no other purpose, she hasn’t done the normal things ordinary girls have done. Of course, she is going to become “emotionless”, which is why her aim is to understand feelings and love. Development is a huge part of this. The fact she’s bland/boring or whatever means there is room for development and growth. The beginning episodes show the faults and imperfections in Violet – Boring, bland, monotone, uninteresting etc. It just makes you want to look forward to the end, where she has developed in some way. The side characters. Once again, controversy. This is all, this anime is, to be honest. Controversy. Some say the supporting cast was original and interesting, while others say bland, bland, bland like every character in this anime. For me, I wouldn’t say they’re original (as in their personality) but yes, I think they aren’t bad. They’re quite cool, I guess. They all have a story, that’s original, that intrigues me. I think there are many different personalities in Violet Evergarden, which is what makes it worthwhile to watch. In conclusion, I don’t agree with some of the accusations that people give. However, there is room for improvement. I love the different personalities in Violet Evergarden, I think it’s one of the things that makes this anime worthwhile watching. I think the lyrics perfectly describe the anime. It’s the perfect song for this anime. The song is peaceful; yet sad. This was an amazing song – something that I really enjoyed listening to at the start of every episode. Would I listen to this in my spare time (if I listened to non-English music)? Yep, definitely. I struggle to pick the best out the opening and ending; they are both amazing and have the same peaceful style. Again, I would definitely listen to this music in my spare time. I’m not going to lie, I think this is the best anime music I’ve reviewed and I actually really enjoyed the music in Violet Evergarden. Do you even have to get me started? 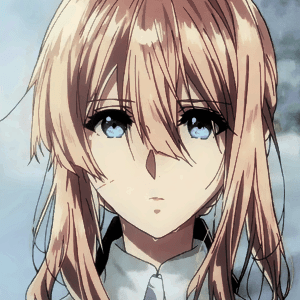 The animation and art style in Violet Evergarden is flawless. Not a single word of negativity in terms of the art. The character design, the movement, the art, everything was amazing. I really enjoyed watching the smoothness of the animation. Especially since I was watching Beelzebub before it – which has decent art but it’s not a modern art style. The animation is 10/10, no argument there. Best animation in an anime. Yep, I’ll go as far as that. Despite the initial disappointment, I liked this anime. It has so much room for improvement, I agree but speaking from a casual anime viewer point of view, it was great. It was simple but executed well – in my opinion, although some disagree. The music and animation were lovely, some of the best out there. It was over-hyped. It deserves hype but the amount of hype it was getting – my expectations were through the roof. Unfortunately, Violet Evergarden failed to meet my rocketing expectations but it was a good, decent anime despite its faults. In the end, most people will forget about this anime and move on to the next season of anime. Thank you for reading because this took a really long time. If you’ve enjoyed this review, check out this review of The Dusk Maiden of Amnesia!